There have been many, many ways to brew coffee over the years, but if you enjoy the pour-over method like you get at your local coffeehouse and wish you had a barista at home to do it for you, well, you almost get that level of service with this cool new Ratio Eight Coffee Machine. This innovative coffee machine is inspired by pour-over coffee making, which helps to release more flavor from the coffee grounds for a richer, bolder taste, but automatically does it for you... in total style. Designed and assembled in Portland, Oregon, this luxurious coffee machine is constructed from sleek die-cast aluminum, has gorgeous hardwood accents, and has a carafe and water reservoir made from borosilicate glass. In fact, the water itself never touches any plastic in the brewing process. 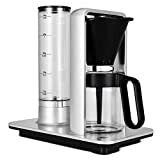 To use, simply insert a conical paper filter or a permanent stainless steel filter in the neck of the carafe, insert your fresh ground coffee, and turn the machine on. The first stage is called bloom, where hot water between 195° and 205° is released slowly through a showerhead flow to precisely saturate the grounds just like a manual pour and even waits until the bubbles settle. The next step is the brew stage where the rest of the water is released and the brewed coffee begins to flow into the carafe... and that's it. 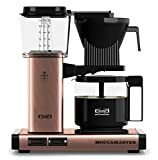 It brews up to 8 cups at a time, has a powerful 1600 watt heating element, and uses a magnetic sensor in the base to stop brewing if the carafe is removed AKA it won't brew all over your counter. As far as coffee makers go, this minimalist machine is flat out gorgeous in a minimalist way, which also makes it the only downside. You're going to need a new kitchen to go with it.